Is it human nature to share? At San Francisco’s Exploratorium, a few eager experimenters stand around a screen with fingers flying. 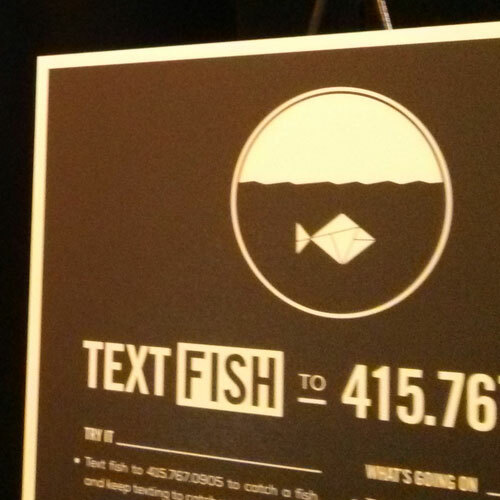 They’re texting, and with each message sent they catch a virtual fish. There are plenty of virtual fish for everyone, but the same thing happens over and over. And over. And over. McDonald has a doctorate in social psychology. His specialty at the Exploratorium is getting people to experiment with and examine human social interactions. Text Fish is just a tech-savvy version of the classic puzzle called the Tragedy of the Commons, and it’s one of many Science of Sharing exhibits. They focus on when we behave altruistically, when we don’t, and why. McDonald says the point is not to manipulate people into becoming more generous. One of the obvious variables in these experiments is that people are more likely to behave altruistically when they have an audience. McDonald says this may be true, but it doesn’t negate the validity of the results. 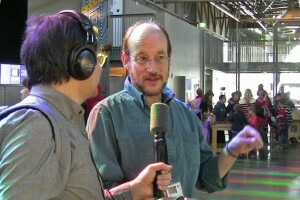 Hugh McDonald talks with TRBQ host Dean Olsher on the floor of the Exploratorium. McDonald says there are parallels not only with climate change, but other global problems that call for humans to share resources. One of the underlying questions with all of these experiments is the source of altruism. Have people evolved to be altruistic? Is altruism inborn, or learned? There are plenty of studies that suggest that humans aren’t the only altruistic species. Bonobo apes share their food, for example. Some animals cooperate and share even when they’re not genetically related. McDonald says there’s certainly an argument to be made that altruistic tendencies are part of our nature. Even if you can determine that, McDonald points out, it won’t always work. There will always be people who choose the selfish route. Along with those people, though, McDonald has observed some who could be game-changers. Once in a while a person not only takes the unselfish route, but holds others accountable as well. “I’ve only seen it a few times but it fills us with joy when we see it,” he says. McDonald says on occasion—rare occasion—someone playing Text Fish will publicly call out a fellow fisherman who is using up all the resources. “That act of, ‘I’m going to advocate for the group, publicly advocate for the group,’ that’s a great moment of social interaction,” McDonald says. Because if no one speaks up, the same thing will happen over and over. And over. And over. Nice description! I’d like to clarify that although I am the Principal Investigator of the National Science Foundation-funded Science of Sharing project and oversee the creation of its exhibits and activities, the Textfish exhibit was designed and built by the esteemed Bill Meyer, Director of New Media at the Exploratorium, and his team. We’ll be experimenting with a variety of new Science of Sharing exhibit ideas at the Exploratorium in 2014, and we welcome all feedback. Thanks, Hugh. We clarified our language.